In Las Mengalas restaurant you can delight yourself in a fusion of ingredients from the Columbian Guatemala, tastes of a diverse culinary region. A menu reinventing traditional dishes and exotic spices. 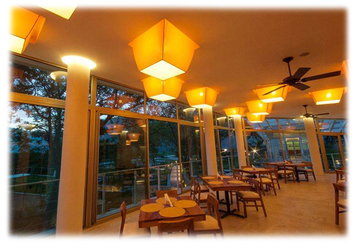 The restaurant is located inside Kawilal Hotel, the first hotel in Central America to have the LEED-NC Gold certification. Do not miss this unique opportunity to taste delicious gourmet dishes while you visit us. Slices of Salmon, marinated in a citrus recipe and covered with mozzarella cheese and toasted sesame seeds. Premium combination of meats and cheeses of special regions, accompanied by special mushrooms recipe and our homemade jelly. An appetizer to share. Breaded brie Cheese over our special marmalade sauce and served with a toasted crostinis. Stuffed Tacos with chicken, avocado and Monterey Jack cheese. Accompanied by sauce of roasted red peppers and a quenelle of goat cheese. Spinach salad combined with cherry tomatoes, onions, nuts, grilled chicken, blue cheese and vinaigrette. Pasta with a parmesan cheese sauce, combined with peas, ham, and bacon. Pasta covered with a gorgonzola cheese sauce, pesto, and grilled chicken. Accompanied by crostinis with pesto. Grilled chicken accompanied by a soft blue cheese sauce. Also accompained by a risotto in cream and avocado slices. Raw fish, shrimp or mixed prepared with lime, tomato, onion, coriander, and Worcestershire sauce. Grilled salmon, laying on a bed of hummus chickpea. Accompanied by peppers, snow peas, toasted sesame seeds and chard. Fried Mojarra Fish served with mashed potatoes and a house salad (lettuce, tomato slices, onion and vinegar). Amatitlán‘s famous dish. Breaded shrimp with the original recipe of the house accompanied by mashed potatoes and house salad. 8 oz of roast tenderloin medallion, bathed in our white cream sauce with green peppers as well as rosemary and red wine brown sauce, accompanied by potato hash, grilled asparagus, sautéed baby carrots and mashed broccoli. Thick-cut roast tenderloin served with grilled vegetables and grilled potato with bacon and sour cream cover. Accompannied by a special chimichurri sauce. Original recipe from ST Restaurant, 6 oz. ground beef, breaded Brie cheese, caramelized onion and spinach. Accompanied by a combination of fried sweet potato, yucca and potato. Delicious chocolate mousse, accompained by strawberries and butter tuile. Covered with grated black chocolate. Sweet corn Créme Búrlée garnished by fresh raspberries and a vanilla tuile. Chocolate crepe with bitter cocoa and toffee sauce, filled with vanilla ice cream and dark chocolate sauce. Macaroon filled with almond cream and fresh strawberries, on a white chocolate sauce, alongside Frutti di Bosco sorbet. Delicious yogurt parfait with fruits on a mixture of granola and honey, decorated with a sweet fresh fruit salad.